In Spending Bill, A Gift For Political Party Fundraising : It's All Politics The Republican and Democratic parties will be able to collect an additional $97,200 per year from donors to pay for presidential nominating conventions. 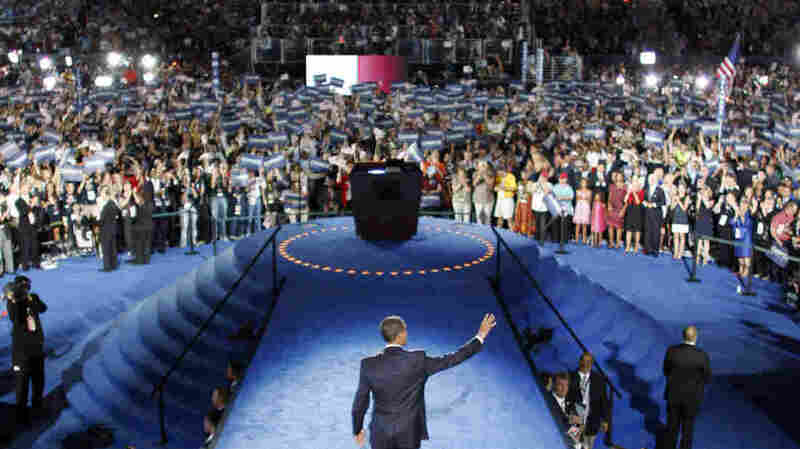 President Obama walks to the podium at his 2008 nominating convention. Lawmakers are inserting into the spending bill a provision allowing political parties to collect up to $97,200 from each donor to pay for their conventions. In another small step on behalf of big money in politics, Capitol Hill lawmakers agreed Tuesday afternoon on a small provision to be added to the omnibus spending bill, allowing the two party committees to raise money for their presidential nominating conventions. The limit per donor would be $97,200 a year, on top of each party committee's existing limit of $32,400 per year. The Federal Election Commission provided some comfort to the parties, letting them solicit cash for newly created convention accounts. But that was a stingy move compared to what Congress intends to do. The $97,200-per-year year limit comes to $388,800 for a four-year presidential election cycle. If the new provision had been available in 2012, just 94 donors could have matched the public financing for both conventions. Or put another way – as the pro-regulation groups would – regular contributions and the new convention account would enable a donor and spouse to funnel more than $500,000 to a party each two-year congressional election cycle. The new provision also allows the party committees to create building funds. As recently as the 1990s, both party committees had building funds, and there was little accountability for the cash in them. On Tuesday afternoon there was no word on how the building funds would be regulated, or what their contribution limits would be. The changes in campaign finance law surfaced without fanfare during negotiations when either Senate Majority Leader Harry Reid or Minority Leader Mitch McConnell could have vetoed them. Six groups that advocate tighter regulation of campaign cash blasted a terse letter to lawmakers: "Our organizations strongly urge you to oppose any campaign finance riders on the Omnibus Appropriations bill that will increase the opportunities to corrupt members of Congress."